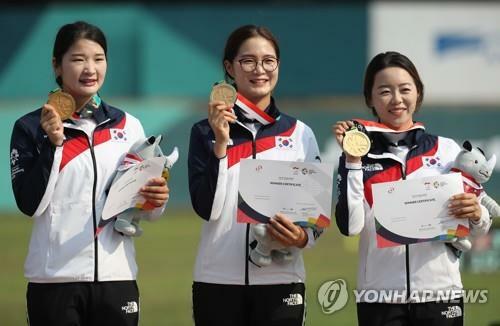 JAKARTA, Aug. 27 (Yonhap) — South Korean archers were on target for three medals at the 18th Asian Games on Monday, including a gold in the women’s recurve team event, and the country also collected medals from bowling and track cycling. The men’s football and basketball teams both reached the semifinals in their respective tournaments, continuing their pursuit of second straight gold medals. South Korea was in three archery finals on Monday and came away with that lone gold from the women’s recurve team event. The trio of Chang Hye-jin, Kang Chae-won and Lee Eun-gyeong defeated Chinese Taipei 5-3 in the set score. The victory extended South Korea’s gold medal streak in the women’s recurve team event to six. The men’s recurve team of Oh Jin-hyek, Kim Woo-jin and Lee Woo-seok, and the mixed compound team of Kim Jong-ho and So Chae-won took home silver medals. All three finals were against Chinese Taipei. South Korea’s stated objective was to win all eight archery gold medals. But the world’s preeminent archery power stumbled out of the gate last week when Chang, world No. 1 and two-time Olympic champion, lost in the quarterfinals of both the women’s individual and mixed team events. South Korea will pick up at least one more gold medal on Tuesday, when teammates Kim Woo-jin and Lee Woo-seok will collide in the men’s individual recurve final. The men’s and women’s compound teams will also compete for gold on Tuesday. South Korea picked up two silver and two bronze medals from the alley on the final day of the bowling competition. Park Jong-woo and Koo Seong-hoi won silver and bronze in the men’s Masters, and Lee Yeon-ji and Lee Na-young did the same in the women’s Masters. South Korea wrapped up the bowling competition with two gold, two silver and two bronze medals from six events. The men and women both won their Team of Six gold medals last week. The unified Korean men’s dragon boat racing team grabbed bronze in the 1,000-meter race on Monday in Palembang, completing a historic run that included a gold and a bronze by the women’s team earlier. The men’s team on Monday finished its 1,000m race in 4:36.459, while Chinese Taipei took gold at 4:31.185. Korea was in fourth place with 250m to go but rallied over the final stretch to nip China by 0.76 second for third place. South Korea earned a bronze in the women’s team sprint cycling as Kim Won-gyeong and Lee Hye-jin teamed up to finish third ahead of Japan. 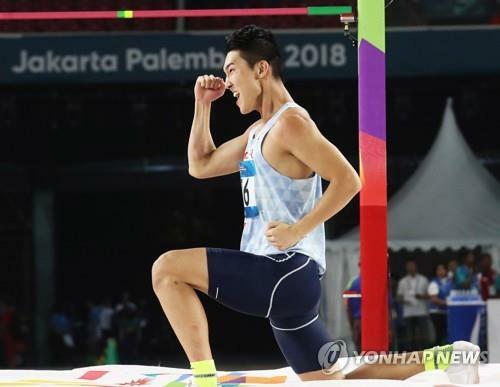 In athletics, Woo Sang-hyeok captured silver in the men’s high jump with his season-best 2.28 meters, just behind Wang Yu (2.30m) of China. Woo is the first South Korean high jump medalist since 2002. The rhythmic gymnastics team delivered a bronze medal behind Kazakhstan and Uzbekistan. The quartet of Seo Go-eun, Lim Se-eun, Kim Joo-won and Kim Chae-woon combined for 151.100 points. The competition combined the gymnasts’ scores from hoop, ball and clubs and then added the best ribbon score from the team. The men’s football team defeated Uzbekistan 4-3 in extra time to reach the semifinals as the memories of a 2-1 loss to Malaysia in the group stage become more distant by the day. Hwang Ui-jo scored a hat trick and Hwang Hee-chan converted the extra-time penalty that proved to be the difference in the grueling victory. South Korea will face Vietnam in the semifinals, with South Korean-born Park Hang-seo on the opposing bench as the head coach of the upstart team. In men’s basketball, South Korea got past the Philippines 91-82 to reach the semifinals. Naturalized South Korean center Ricardo Ratliffe had game highs of 30 points and 14 rebounds. Jordan Clarkson, the Cleveland Cavaliers’ Filipino-American guard, scored an inefficient 25 points on 10-of-25 shooting. Next up for South Korea is Iran in the semifinals on Friday. It’s a rematch of the final at the 2014 Asiad, where South Korea staged a dramatic fourth-quarter comeback for the gold. The much-maligned baseball team, coming off a 2-1 loss to Chinese Taipei, hammered Indonesia 15-0 for its first preliminary victory. Hwang Jae-gyun, a third baseman getting an emergency start at shortstop, launched a pair of home runs and knocked in five runs.